Ahh, so this is where Johnny Cage comes from? American Frank Dux (Jean Claude Van Damme) is an Army soldier and a super-skilled martial artist. At a young age, he was trained by sensei Senzo Tanaka (Roy Chiao) in the various fighting artforms along with Tanaka’s son Shingo. A family tragedy comes over the family, one that forces Senzo to impart his full knowledge and skill unto Frank. Wanting to honor the Tanaka clan, Frank feels that the best way to do so is to compete in the Hong Kong-based Kumite, an illegal underground fighting tournament that honors the best fighter. Receiving Senzo’s blessing, he leaves his responsibilities to travel to Hong Kong, where he befriends a fellow American fighter (Ray Jackson) and reporter Janice Kent (Leah Ayres) who is trying to get more info on the Kumite. The Kumite is secret, and anyone who fights in it accepts the risk of death. 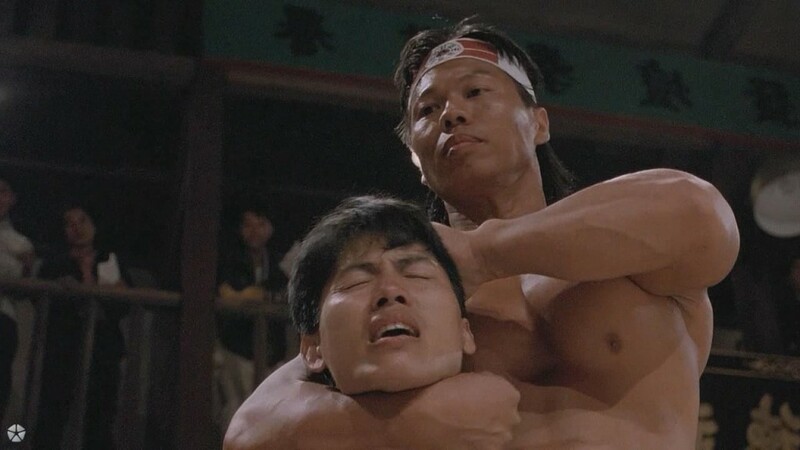 No matter how many ways you punch it, kick it, snap it, or chop it, Bloodsport is a bad movie by most standards. A paper-thin plot, bad acting, and inconsistent editing are all found here. But if this is held to the standards of the best that cinema has to offer, it is, at least to yours truly, wrong to do so. On its impact on martial arts and sheer watchability? 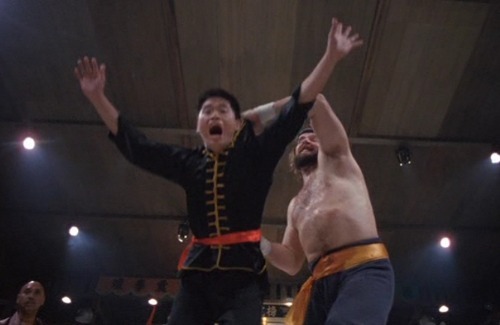 Bloodsport is “good,” and pretty entertaining. 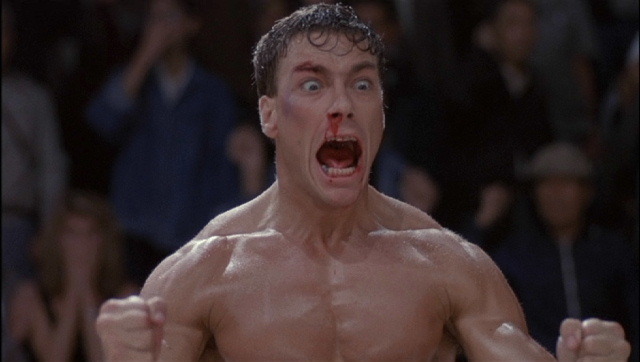 Bloodsport can’t be talked about without bringing up Jean-Claude Van Damme’s first. “The Muscles from Brussels” has done many (straight to home) movies over the years, but his breakout role as Frank Dux may possibly still be his best. JCVD is legitimate as a martial artist, and makes moves looks pretty effortless on film. As an actor, he’s average at best and an embarrassment at worst, made worse by the fact that his character is 100 percent American with a Belgian accent. Nominated for the Worst New Star Razzie, one can certainly see why, but the bad that JCVD puts in turns out to be so damn good. Luckily, there’s enough of “so bad its good acting” to go around in this that everyone gets a chance to shine. Whether it be a young kid playing a teenage Frank Dux (possibly the worst performance I’ve ever seen), the other American fighter Ray Jackson who looks like he belongs on a buffet table instead of a fight to the death tourney, the blonde reporter who only serves one purpose, or even a commanding officer who would go on to win an Oscar, Bloodsport is full of deliciously challenged performers delivering equally poor lines. And it is made all the more memorable because many appear to take their roles seriously. Not only did Van Damme use this as an acting vehicle, he also had a hand with the final product in the way of editing. The slow-motion effect does become overdone, and Van Damme and director Newt Arnold love montages maybe a little too much, but he manages to compile solid-looking martial arts action, which is the reason why anyone likely views this. For my money, though, the best things about this film are easily the 80’s power ballads that accompany any of the important scenes, with Paul Delph’s On My Own taking the title. They are one of the purest representations of cheesiness that exist in cinema history. 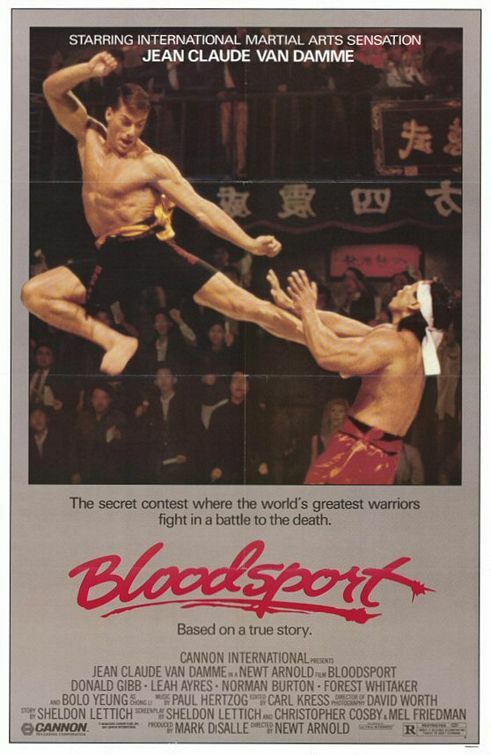 Whether the events of the film are real or entirely fabricated, Bloodsport has, in all of its cheap and hilarious flaws, served as very real inspiration for franchises like Mortal Kombat, and any other low budget straight-to-video fighting movies. Long live the Kumite, Kumite, Kumite. Even if it actually didn’t exist, it feels like it did. Photo credits go to gymtalk.com, moviepostershop.com, and moviebuzzers.com. Love this film! I think it is Van Damme’s best, but I also love Kickboxer and I really love Nowhere to Run. Great job! I need to see Kickboxer, also on Netflix! JCVD is a stud here, and everything he does is awesome lol. You.. have.. never.. seen.. Kickboxer? You need to rectify that immediately. I can’t say I’ve had the pleasure. I’d love to see your take on it Jay!